Posted 5 September, 2015 by Prabhat & filed under Blog, Marketplaces. This blog post is specifically created to give you new ideas of increasing your online revenue. 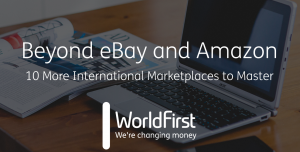 Mark from World First shared his idea “Beyond eBay and Amazon” which talks about marketplaces that you may have heard but never explored. Checkout this PDF document which may push you forward in Marketplaces.